Been performing live and in the studio most of my life. I was born in Austin, Texas, and grew up in Ft. Worth, Texas. I have had a love for music and have been playing drums and percussion for as long as I can remember. At age three I started to beat on pots and pans. I began playing drums in 6th grade when my parents purchased my first drum kit. I also started a band with my best friend in 6th grade and have been playing gigs ever since. I played snare drum all through middle school and high school as first chair snare drummer, as well as drum captain, and I made All City Band first and second chair for snare drum several years in a row. I was even the Drum Major, conducting and leading my high school band my final year of high school. I then went on to study Jazz Studies and Percussion at The University of North Texas. I have taught drum set and percussion lessons as well. I moved to New Mexico in 1998 to attend The University of New Mexico, where I studied Communications and Anthropology. I have played in several bands touring the U.S. and produced and recorded several records with various bands. While in New Mexico I ran sound and stage managed at The New Mexico State Fair for three years in a row. While playing as a professional musician in New Mexico, I decided it was time for a change and moved back to Austin, Texas. I purchased my house and built my own recording studio. I then decided to attend Media Tech Institute, where I recieved a certificate in Recording Arts and Pro Tools Certifications. Developing a love for audio, I then worked at Media Tech as a Lab Instructor for a year and interned at Willie Nelson's recording studio, called Pedernales Recording Studios. I currently own and operate Jackrabbit Soundshack Recording Studios where I record local music. 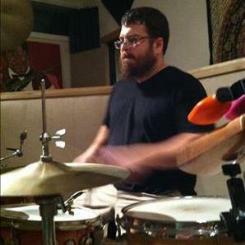 I continue to play gigs on drum set and percussion, while also working at Music and Arts. As a music store, we offer instruments, music lessons, instrument repairs, instrument rentals, accessories, and sheet music to students and educators from programs in Austin ISD, Hays Consolidated ISD, Dripping Springs ISD, Lake Travis ISD, Eanes ISD, Leander ISD, as well as in private schools such as Veritas Academy, Regents, and Austin Waldorf. We love to support the local Austin music scene.